How many clips can you fit in your hair? Imagine this girl going through a metal detector lol! I like emo hair, but how many clips are too much? do you think this is too much? 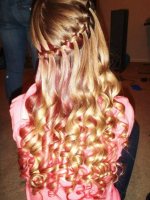 or are you quite happy to go to scchool tomorrow with your hair done like this?